An aerial view of the Rifflin'Hitch Lodge in Southern Labrador lets one see what a prime location this fishing lodge has. The Eagle River runs alongside the lodge with the rest of the area consisting of lush green wilderness. 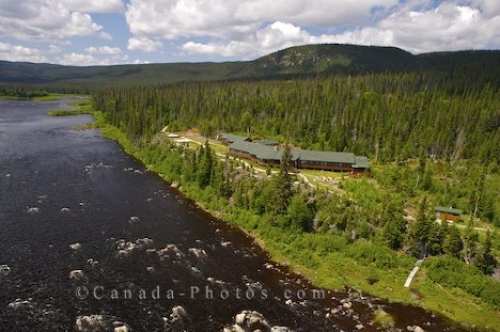 Aerial view of Rifflin'Hitch Lodge, Eagle River, Southern Labrador, Labrador, Newfoundland Labrador, Canada. Property Released. Aerial of the Rifflin'Hitch Lodge in Southern Labrador, Canada surrounded by miles of wilderness.